Just to recap, I made this bread for the first time last night as part of our Irish Night to celebrate the arrival of my Great Great Great something Grandfather John Curtin in Australia 160 years ago. I’ve never tried authentic Irish Soda Bread so I have no idea what it’s supposed to be like. Unfortunately when I made this for our special Irish celebration last night, I was rushing to get the pavlova into the oven and as a result neither were cooked properly. When I sliced into the bread, it was still raw in the middle and because the pavlova was now cooking in a very slow oven, I had to use the microwave to finish the job off and nuked it for 5 minutes. No doubt, I would have been tried for murder in Ireland for committing such a crime but the bread seemed to recover and went well with our Irish stew. The family all enjoyed it whether it was authentic or not. I should have been a bit more cautious about making this bread. The recipe came with all sorts of warnings and tricks and making it on the run while juggling the oven to get the pavlova baked before midnight, wasn’t a good idea. Moreover, when you are making something that is a tradition, you are stepping onto hallowed turf and you need to do it justice or at the very least show a little respect. Moreover, I must confess that the loaf of bread featured in the photo above was actually my second attempt. You can see the original down below looking rather sorry for itself. My other mistake was recruiting my 8 year old daughter to help make it. This recipe called for a very light touch and if you check my previous post about the kids making pizza, they love getting their hands into dough, coating their hands with the stuff and using it as play doh. I kept telling mix not to mangle it but she couldn’t resist. I have to say that it is much easier just to buy a loaf of bread at the supermarket and with all those great advances in technology, it even comes sliced. If you really must bake your own bread, bread makers are wonderful machines. I just chuck everything in mine and it turns out a perfect loaf every time. However, neither of these options are authentically Irish and I wanted to cook the real deal. Have an authentic Irish meal albeit in Australia. Although I haven’t tried the real thing, I did a Google search and found what looked like a fairly authentic recipe which had quite a preamble initiating the uninitiated into the fine art or is that complications of making the real deal. All these warnings and specifications did make me feel rather wary about taking on the great Irish Soda Bread challenge. There seemed to be so many things to go wrong and this dough really does seem very fussy and demanding compared to throwing everything into the breadmaker or simply buying a loaf of bread at the supermarket. But there’s nothing like making your own bread and wanting to have an authentic Irish night, I had to have a go. 1) Irish flour is soft and low in gluten so the bread will have a different consistency when other flours are used.. If you can’t get Irish flour, use unbleached flour or Plain Flour. Do not use bread flour. It is very high in gluten and simply will not work in bread which do not use yeast. 2) No kneading and only use a light touch to mix the dough ie use your fingers rather than your full hand to mix the dough. 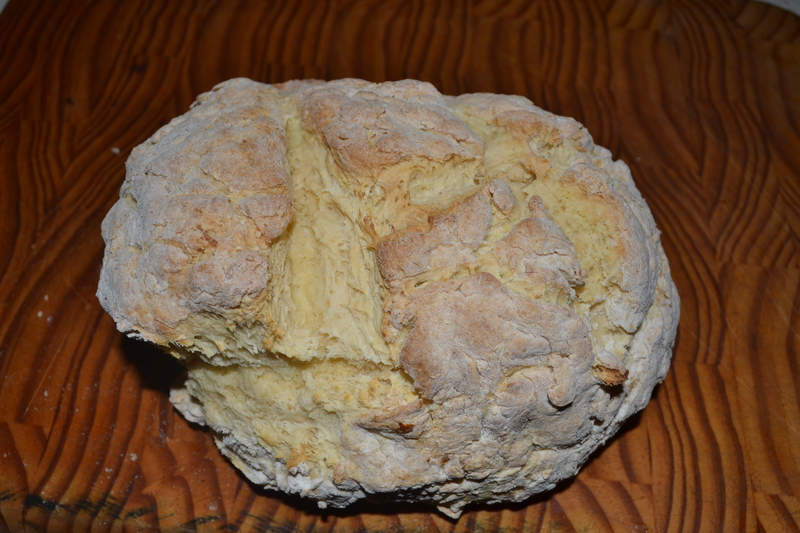 This was my first attempt at the Irish Soda Bread which you could describe as a very “rustic” attempt. Pre-heat oven to 230 degrees C . Wait until the oven is hot before you add the bread. Grease oven tray and have it ready to go. Sift flour, bicarb soda and salt into a large bowl and mix. Make a well in the centre of the flour and add the milk. Quickly and with a light touch bring the flour in from the sides and mix with the milk, until all the ingredients come together into a dough. I initially used a knife to mix the milk into the dough and once it had formed some kind of ball, used my fingers. I didn’t really feel like getting my fingers wet. It is impossible to be exact about the amount of buttermilk needed, it will depend on the nature of the flour. The dough should not be sticky and should come together into one lump of of soft, slightly floppy dough. Keep adding flour until you get the consistency right. Once the dough had come together, do not knead it. Simply place it on a floured board and rub flour into your hands so they are perfectly dry and shape the dough into a flat round which is about 5 cm thick. Place on a baking tray. Dust the handle of a wooden spoon with flour and press into the dough to form a cross. This gives the bread its tradition cross-shape and also helps the bread to cook through more easily. I have also read that this lets the fairies out of the dough. This process should only take 5 minutes and you need to get the bread in the oven immediately. Quick. On your marks. Get set! Go! Set timer for 5 minutes. Turn the oven down to 200 degrees C. The initial high temperature ensures a good crust. Set timer for a further 20 minutes and take the bread out and knock on the bottom. If it sounds hollow, it’s done. If not, pop it back in the oven for a further 5-10 minutes and check again. Mine sounded hollow but my sense of pitch must have been out and it was still raw in the middle. Worked better the second time round. This bread should be eaten on the day that it’s made. The next day it resembles something of a brick which could indeed inflict grievous bodily harm but did resuscitate to make good toast. I had a slice of it as toast with Vegemite on it this morning just to put my Australian stamp on the stuff. The leprechauns would be shaking in their boots. I made the Irish Soda Bread again tonight and this time resisted calls for pavlova for dessert. I also made it myself without intervention from the kids. This time it was cooked right through and also looked more like the real thing with a proper cross through the middle. We all really enjoyed it and I can see it making regular appearances at our place all the way Down Under. 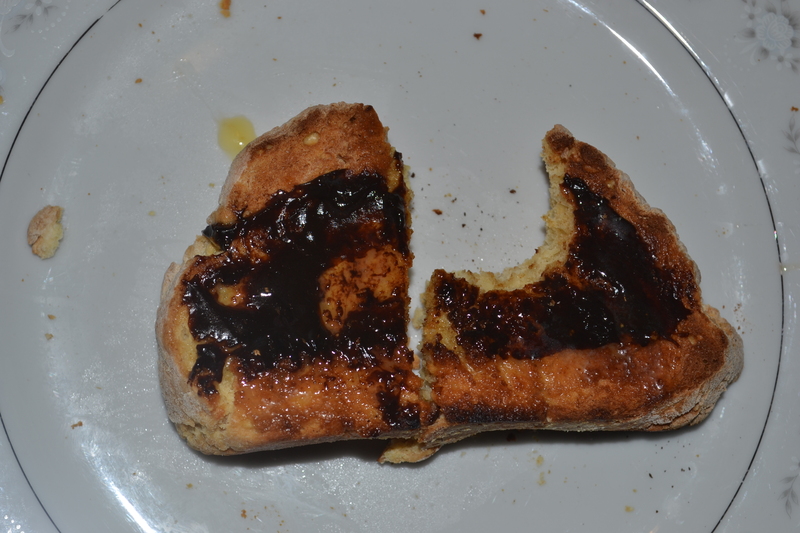 Irish Soda Bread with Vegemite. 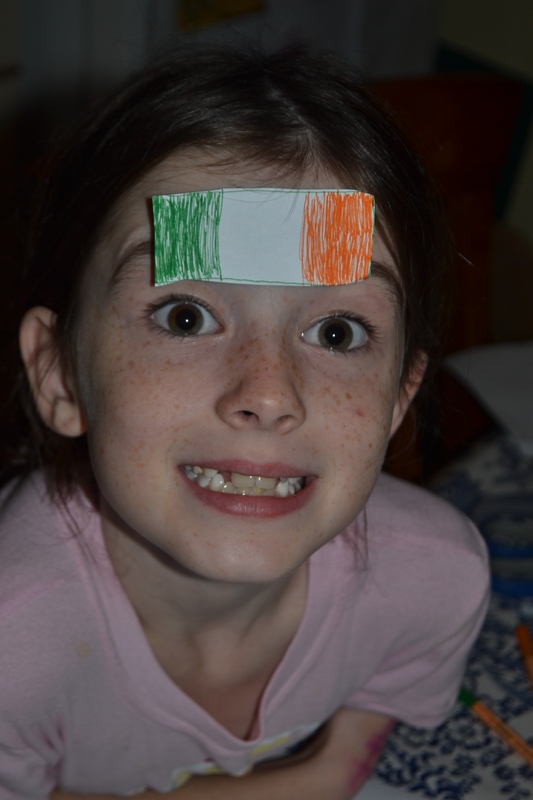 This entry was posted in Baking, Kids learn to Cook, Parenting, Travel, Uncategorized and tagged Australia, bread making, cooking with kids, ireland, Irish, Irish Cooking, mom, mum, Mummy, parenting, Sydney on April 5, 2014 by Rowena. I made the Irish Soda bread again for the first time in a few years last night. I have no idea what the original is like,but I have a three page outline to try to achieve the real deal. You actually need Irish flour which is low in gluten but our Australian flour is high in gluten. I also struggle to get it to cook through. Everyone has different interests and times change but I really recommend you get some lessons from your Mum and grandmother while you can. I know we have fasmily recipes and because someone else makes it, you don’t bother but then the person passes and so does the recipe. Food memories are so powerful for me. You can’t bring the person back to life in the flash, but recreating a food memory helps. My mum makes the best sponge cake ever and she adds a little bit of warm milk and melted butter to it. Makes such a difference. I haven’t been to Ireland and would dearly love to go. I have a few ancestors who came from County Cork…Cork City, Midleton and Mallow. I’ve done quite a lot of research, especially on the Great Famine.